The dreaded laryngitis/lurgy type thing I’ve encountered this season lingers on and I’m now past the three-week mark. I am much better but am certainly not helped by the fact that I’ve hit a very busy time of year and have been running around a bit like a headless chicken. It was back to Ireland again this week, this time to the wee North and a day’s filming at the incomparable Royal Portrush Golf Club, host of the 2019 Open Championship, just in case you haven’t been paying attention. The weather was glorious, with lots of sunshine but boy, was it cold. I mean deep-down, right-into-your-bones sort of cold. The programme, a documentary to be shown on BBC 2 Northern Ireland ahead of the Open next July, is fronted by the incomparable Gerry Kelly, one of Ireland’s most popular broadcasters and journalists and erstwhile prolific presenter on Ulster television. Gerry delves into the beginnings of golf in Scotland and traces innumerable links to Irish golf in a “Who do you think you are?” type of way and apparently I was required for the final segment of playing a few holes and previewing next year’s return of the Open to the Portrush links. Special thanks here to producer Graham Little who convinced me I was the right person for the gig. If I hadn’t listened to him, I wouldn’t have had the chance to work with one of the best – so, thank you, Graham. Normally I would have a nice pic to put in here but forgetting to take my phone on the course and the extreme cold put all such thoughts from my mind. You’ll just have to hang on till the documentary comes out but don’t worry, I’ll remind you nearer the time! 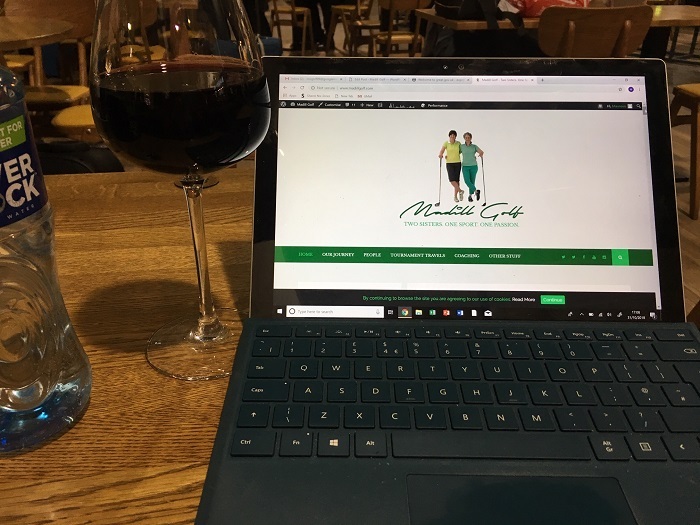 Blogging ………… with lurgy medicine at hand. Bottle of water just out of shot! It’s been an interesting year, off the golf course as well as on it. In May we started having some work done to the house which meant that the contents of four rooms were boxed up and put into storage. These much-loved possessions were liberated ten days ago and it was with great excitement that I stood in the conservatory directing assorted boxes and furniture to the correct rooms. Ten minutes into my traffic warden job I began to think to myself I had no idea we had accumulated so much, well, rubbish, frankly. At this point Patricia appeared and succinctly asked, “Well, have you seen anything come down the drive yet that lifts your heart?” I think by now you can probably guess the answer. I decided on the spot that I would have a total cull of the garbage we had for some unknown reason refused to throw out – it was not going back into cupboards and drawers “to be dealt with later”. It wasn’t going to make it into said cupboards and drawers again – particularly in the study. One thing I’m quite proud of, and which gives me great pleasure, is my collection of golf books, some autobiographical, many instructional. At Portrush Gerry had been telling me about some of the people he had met in the course of making the programme. He encountered serious collectors and chroniclers of our sport, owners of prolific collections numbering thousands and thousands of individual pieces. 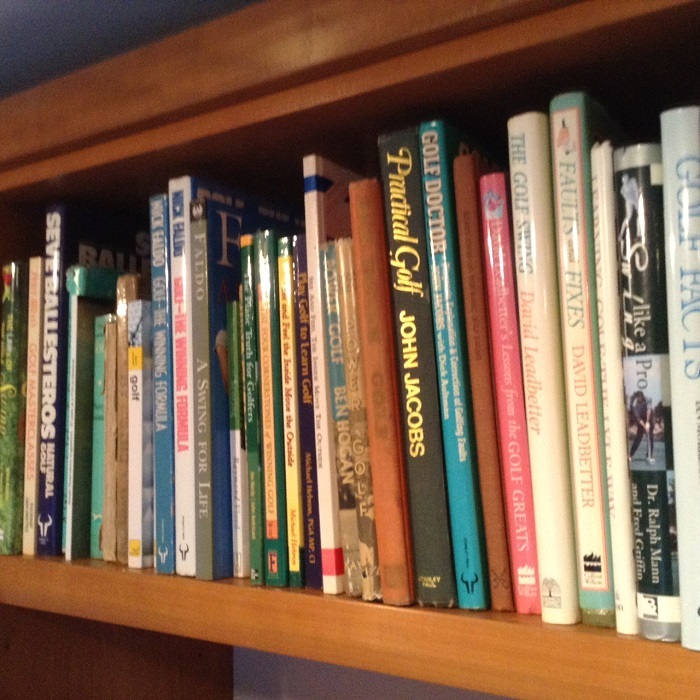 I was thinking of this as I was doing a bit of sorting the other day, (trying not to start leafing through and reading too much) and was struck by several of the authors’ names adorning my shelves – Seve Ballesteros, Jack Nicklaus, Gary Player, Nick Faldo, Mike Hebron, Pia Nilsson, Sam Snead, Peter Alliss, Dai Rees, Peggy Kirk Bell, Kitrina Douglas, Annika Sorenstam, Ken Brown, John Jacobs, to name just a few. I realised with a start that I HAD MET all these people, had had the pleasure of spending quite a lot of time with a number of them and was privileged to call many of them my friends. The books are slowly but surely moving from the boxes back to the shelves. 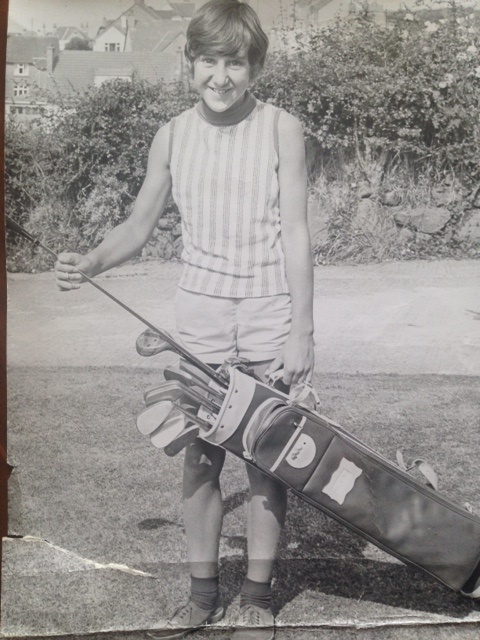 And once again I found myself sending a heartfelt thank you to Mum and Dad, wherever they may be now, for introducing their two girls to this phenomenal game called golf. I wonder could they ever have envisaged the wonderful world they were opening up for the two of us? At ten years of age I already I knew I was lucky……..just not how extraordinarily lucky. Hardly changed a bit. Hope better soon. We may not have fully appreciated the gifts our parents gave us at the time, but better late than never, eh?